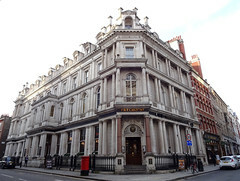 Wetherspoons pub on Chancery Lane in Holborn. It's quite upmarket for a Wetherspoons, due to its location in the heart of lawyer-land. The main room is high-ceilinged and spacious, with chandelier-style lighting and ornately-moulded pillars. It does get crowded in the post-work hours, though, and much of the seating on this level is at high tables. A mezzanine floor above this consists of a number of small rooms all connected together, which can be booked out for private functions, though there's no bar on this level. The toilets are in the basement, and the ladies' at least are quite spectacular (but also a little disorienting, with mirrors everywhere). Kake visited on a Wednesday afternoon in January 2016. About a third of the ground-floor seating was taken when I arrived around 2:30pm. No music was playing, but there was a good buzz of conversation. It quietened down a bit during the afternoon, but gradually got busier again, and by the time I left around 6:30pm there were very few seats left either upstairs or downstairs. There were several real ales on, including Flack Catcher, Pilgrim Gold Spice, Stone Levitation, Sharp's Doom Bar, London Pride, Moorhouse Pride of Pendle, Jennings Red Breast, Acorn Barnsley Gold, and Adnams Ghost Ship. A pint of lime and soda was 99p. Like most Wetherspoons pubs, food is served all day from a chain-wide menu. In January 2016, Kake's burrito photo was fine if nothing spectacular. Accessibility: Three steps to get in, with handrail. To get to the mezzanine, there's a half-flight of stairs with a handrail most but not all of the way up. To get to the toilets, there's a curving flight of stairs with a sturdy handrail and two landings. Last visited by Kake, January 2016. Opening hours taken from the Wetherspoons website, January 2016. Last edited 2016-01-23 18:14:44 (version 22; diff). List all versions. Page last edited 2016-01-23 18:14:44 (version 22).